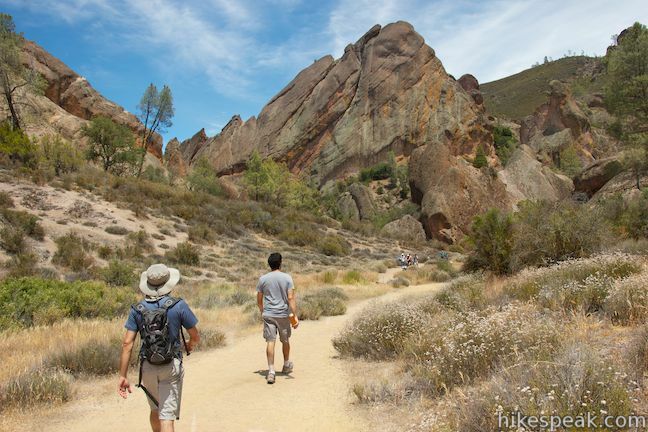 Pinnacles National Park preserves some of California’s oddest landscapes with out-of-place rock spires and boulder-filled gorges with talus caves just waiting to be explored. 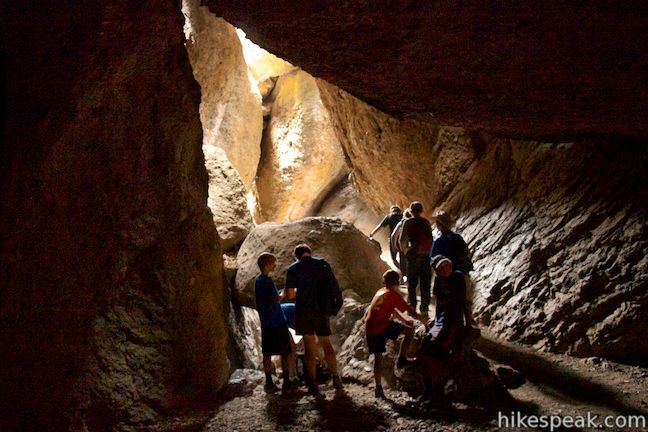 Grab your headlamp and head to the west side of Pinnacles National Park for a trek into Balconies Cave. 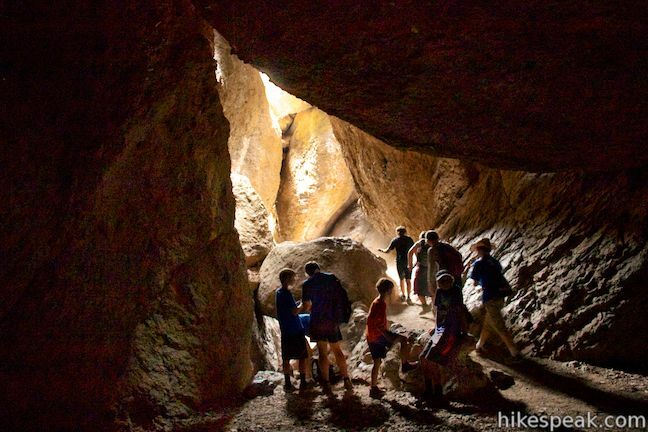 This fun 2-mile out and back hike or 2.4-mile lollipop loop hike crosses a playground of volcanic rock formations and journeys through the dark, twisting passages of Balconies Cave. The most direct route to the cave (described here) takes Balconies Trail from Chaparral Trailhead on the west side of the park. 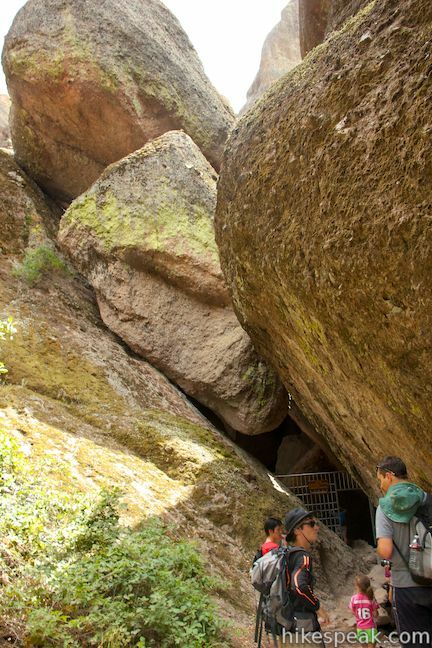 Balconies Cave may also be reached from Old Pinnacles Trailhead on the east side of the park by hiking up Old Pinnacles Trail for a 5 or 5.4-mile hike, or as part of the grander High Peaks – Balconies Cave Loop, which passes both trailheads. 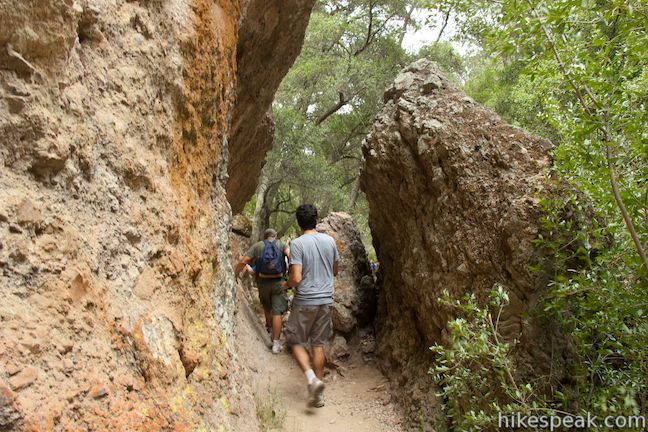 Before getting underway from Chaparral Trailhead, just what is a talus cave? 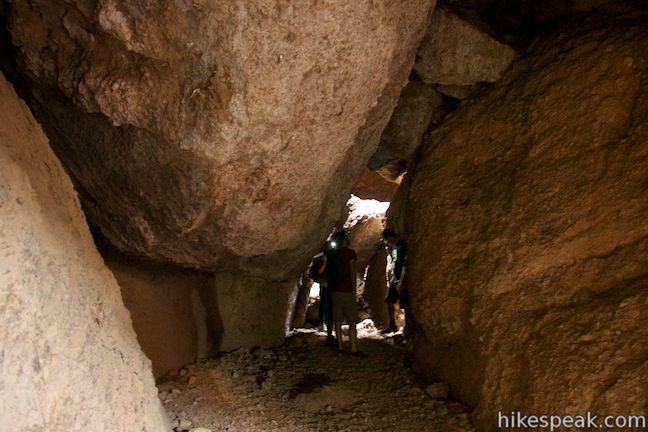 Talus caves are formed when boulders tumble into a gorge and create a cave ceiling. They aren’t traditional caves that go into the sides of mountains, but can be really fun to explore. In this case, the canyon was created by faults that fractured the area’s volcanic rock. Earthquakes and landslides loosened surrounding boulders that fell into the gap. 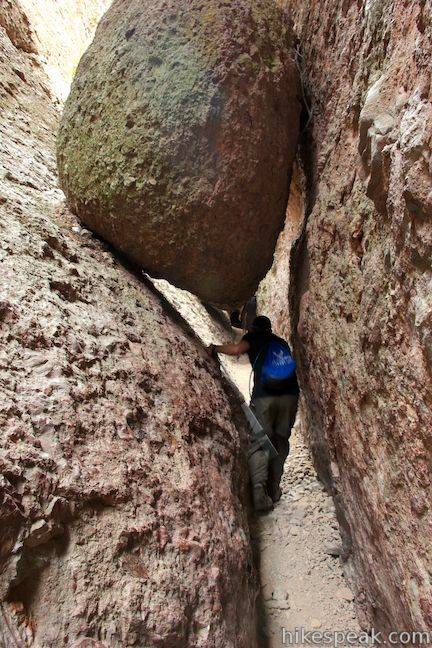 The boulders that make up the cave (some of which are bigger than houses) did not fall into the canyon in a neat, organized way. You will have to climb down and around boulders and through openings to get across Balconies Cave. Sound fun? 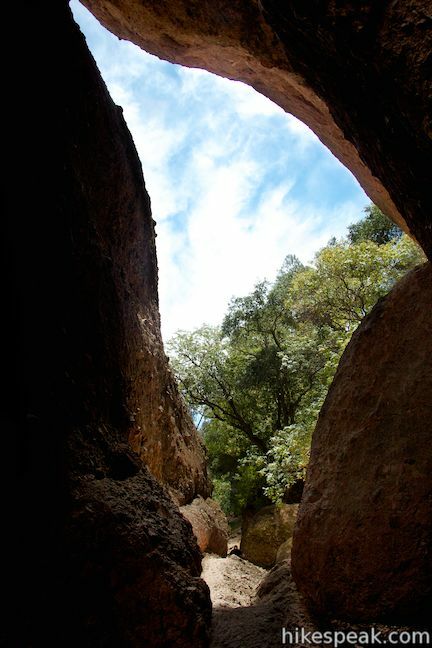 For the most direct route to Balconies Cave, the journey begins from Chaparral Trailhead on the west side of the park. Note that there are roads entering the east and west sides of Pinnacles National Park, but no roads through the park between the two sides. 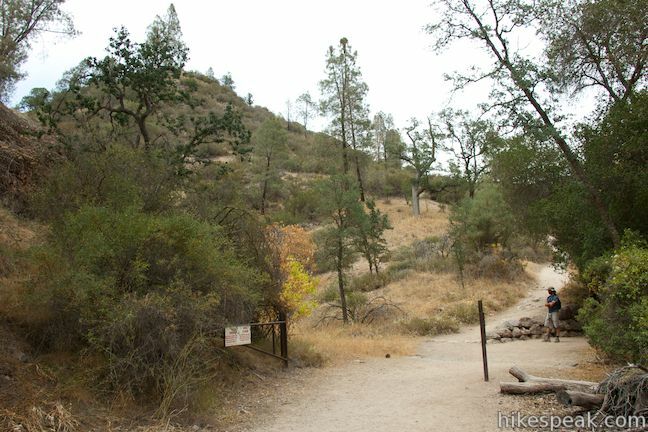 Chaparral Trailhead is at the end of the road on the west side of the park, and from there you’ll set out on foot toward Balconies Cave. Another trail, Juniper Canyon Trail, heads southeast from the trailhead toward the High Peaks. 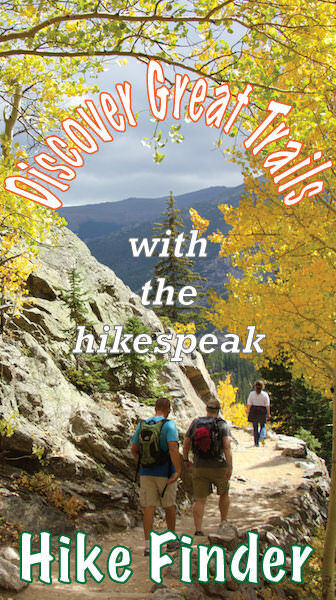 Be sure to take Balconies Trail, which heads northeast. You can start on either the trail leaving the north end of the parking lot or the trail that runs up the east side of the parking lot. The two unite and head northeast down a wide sandy trail toward the Balconies. There are a few picnic tables near the start in case you’re already hungry. Balconies Trail heads gradually downhill into a canyon framed by tall rock formations. Straight ahead, a daunting cliff known as Machete Ridge spikes up above the trail. 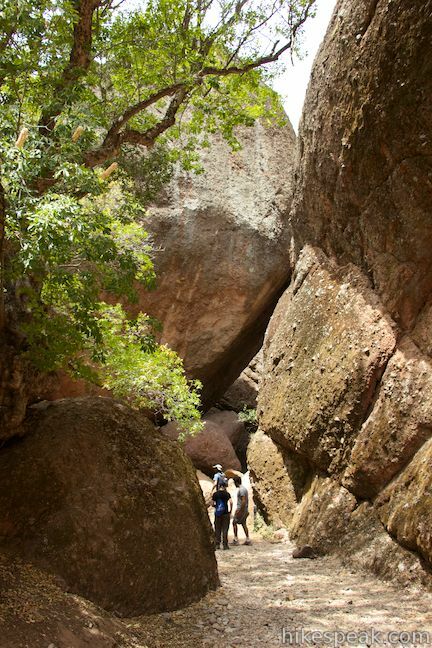 There are several climbing routes along the trail, so keep an eye out for climbers in the rocks above. The orange, oddly shaped rocks around you almost glow with excitement for what lies ahead. The rock walls get closer together as the trail weaves along the bottom of the canyon. Cross a footbridge to come to a junction, 0.6 miles from the start. Balconies Cliffs Trail ascends to the left, and runs along the cliffs above Balconies Cave. The cliffs trail meets back up with the cave trail on the other side of Balconies Cave and can be used to form a short lollipop loop through the Balconies. 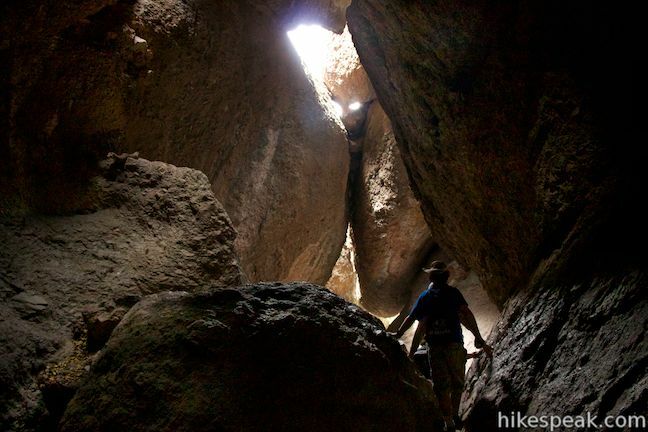 It is a 0.4-mile hike through Balconies Cave to the other end of Balconies Cliffs Trail. The cliffs trail covers that ground over 0.8 miles. If you just hike through Balconies Cave and back, it is a 2-mile round trip hike with 200 feet of elevation change. If you use Balconies Cliffs Trail to make the loop through the Balconies, the hike extends to 2.4 miles round trip with some added climbing. 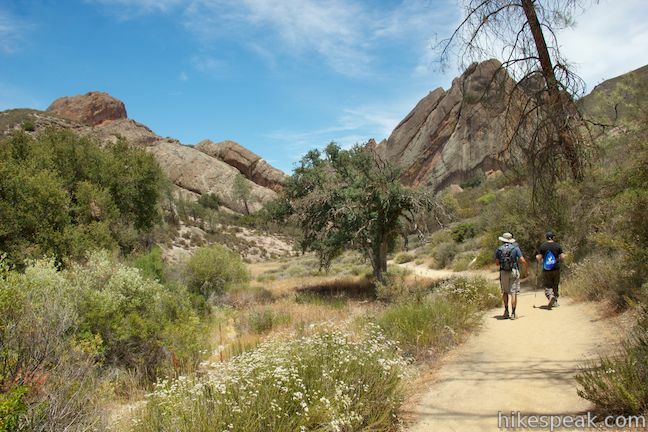 Stay to the right past Balconies Cliffs Trail to continue along the bottom of the narrowing canyon toward the cave. When you reach the path into the cave, the sides of the canyon will only be a few feet apart. Pass a sign that reads, “Caution – flashlights required – low ceilings – dangerous when wet” and come to a metal gate at the entrance of Balconies Cave. The cave gets closed off when storms and high water levels make the passage dangerous. If the gate is open, that’s your signal that it’s ok to go into the cave. 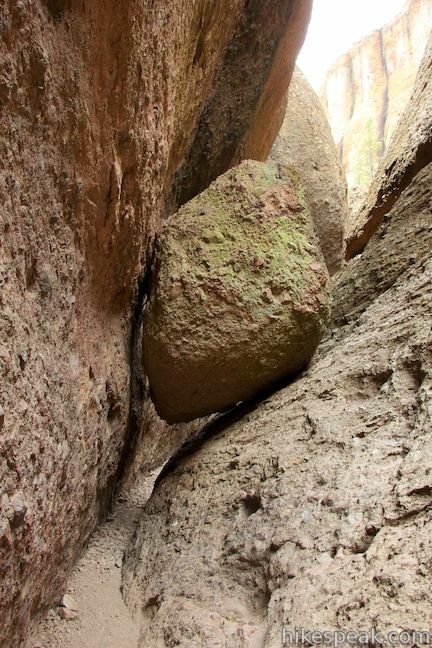 Squeeze through the rocky gap and duck around boulders to reach to the dark cave. 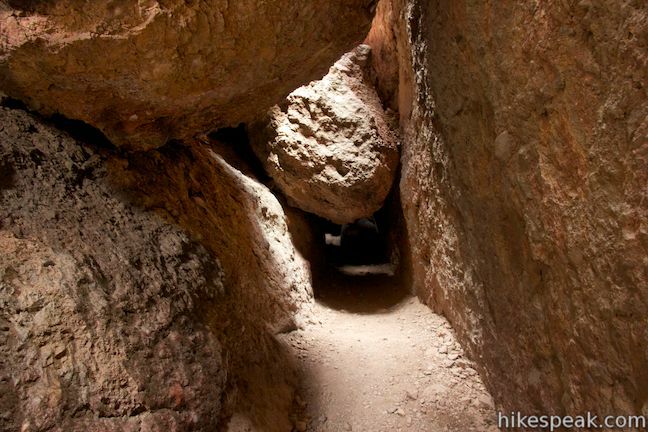 Take out your flashlight or put on your headlamp and follow the trail down into a dark chamber below the boulders. Pools of light illuminate small areas of the darkness adding dramatic flare to the fun route. Climb out of the first section of Balconies Cave and return to daylight. Then plunge back into the darkness into a bigger chamber in a second section of the cave. 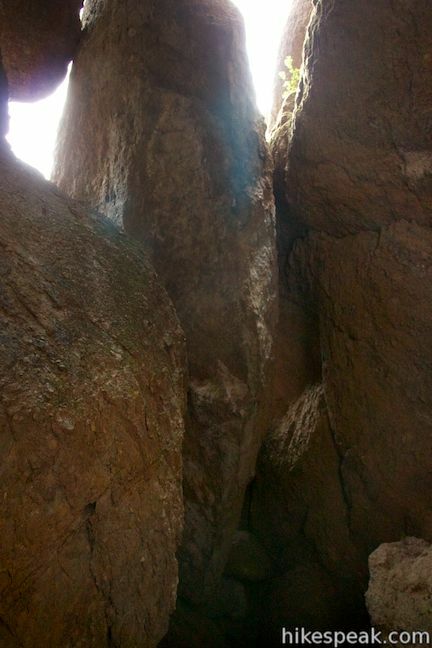 Sunlight squeezes through cracks around the massive boulders overhead. You may find a seep of water trickling down between the rocks in the dark recesses at the back of the cave. 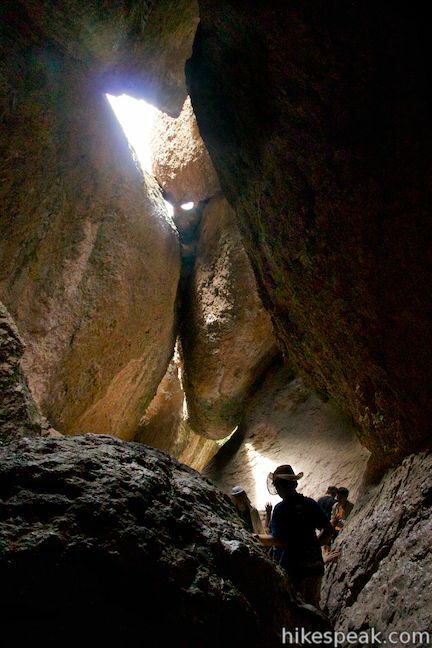 Climb your way through twisting, turning passages to come to another gate at the end of Balconies Cave. The trip through Balconies Cave will leave you wanting more, and you may actually venture back through the cave a second before deciding what to do next. As you step away from the boulder playground on the northeast side of Balcones Cave, you will come to a junction with the other end of Balconies Cliffs Trail, again on the left. 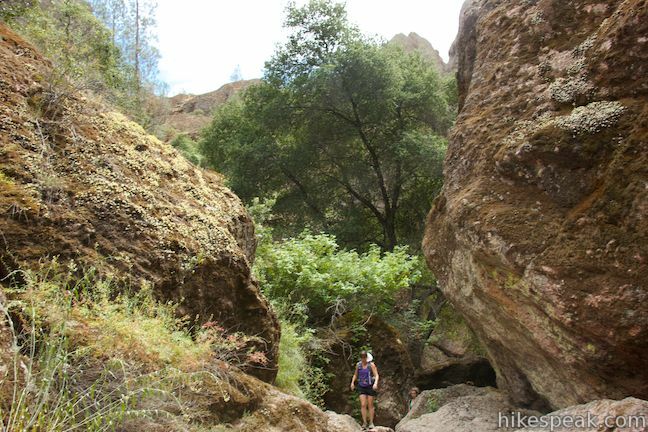 Old Pinnacles Trail, heads to the right, running down a wide, sandy canyon for 2.1 miles to Old Pinnacles Trailhead. 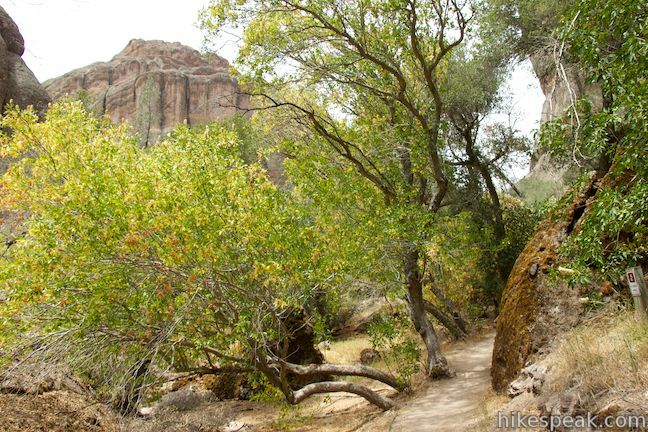 To get back to Chaparral Trailhead, either turn around and hike back through Balconies Cave or turn left up Balconies Cliffs Trail and see what’s going on in the Balconies above the surface. No permit is required to hike to Balconies Cave. 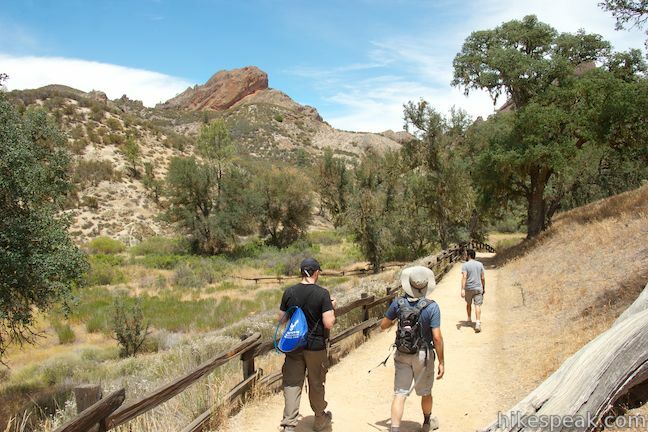 Pinnacles National Park has an entrance fee ($20 as of 2017) that is connected at the park’s West Entrance Station. The entry station is open daily from 7:30 a.m. to 8:00 p.m. with a gate that restricts access outside those hours. Don’t worry, the gate will automatically open if you need to exit the park after eight o’clock. 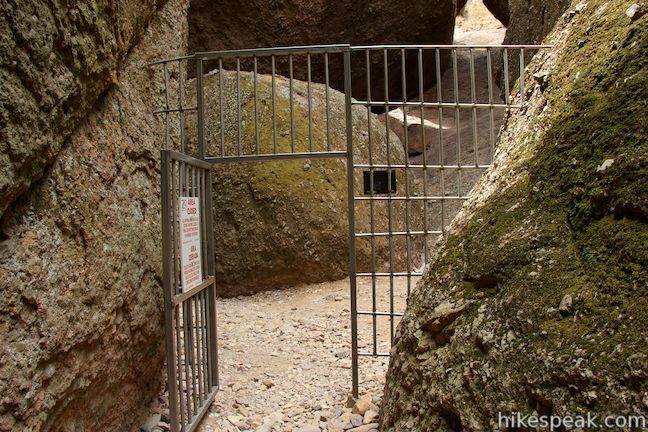 Camping is prohibited on the west side of Pinnacles National Park, so check out Pinnacles Campground in the east side if you want to stay overnight. 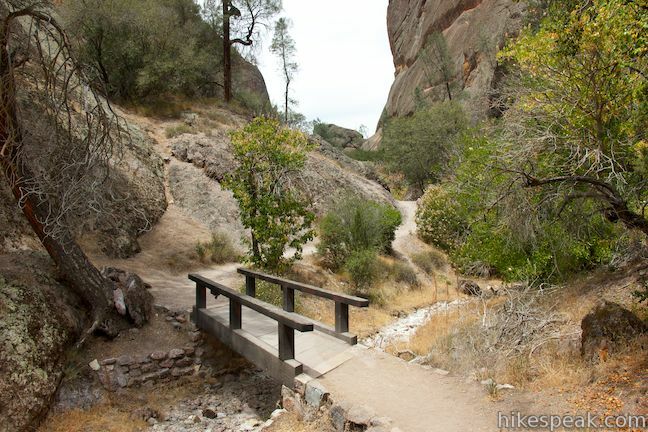 Dogs and bikes are not allowed on trails in Pinnacles National Park. Check the park’s cave status page to confirm that Balconies Cave is open before you set out. The park’s other talus cave, Bear Gulch Cave, closes at scheduled intervals to protect a colony of Townsend’s big-eared bats that live in the cave. If you travel to the east side of the park and Bear Gulch Cave is open during your visit, it is definitely worth checking out. 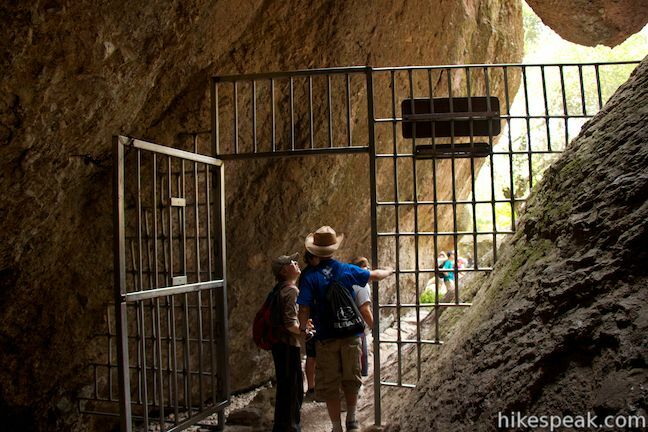 If it is closed, Balconies Cave will be the only place in the park where you can hike through a lengthy talus cave. 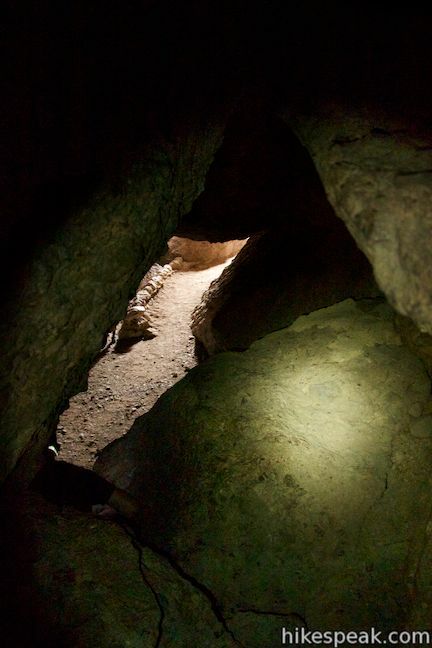 You will want to have a light source with you when you pass through Balconies Cave, so pack a flashlight! To get to the trailhead: Take Highway 101 to Soledad and take exit 302 onto Route 146. After the offramp, merge onto Front Street, headed northeast. Make a right on East Street and a right on Metz Road to leave town on Route 146. After another 2.7 miles, you will need to bear left to stay on Route 146. 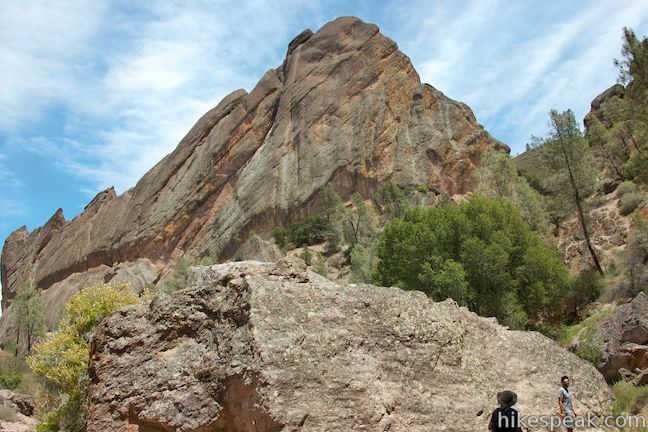 Drive another 7 miles to reach the West Entrance of Pinnacles National Park. Pay the park entrance fee and drive another 2.3 miles to the trailhead at the end of the road. 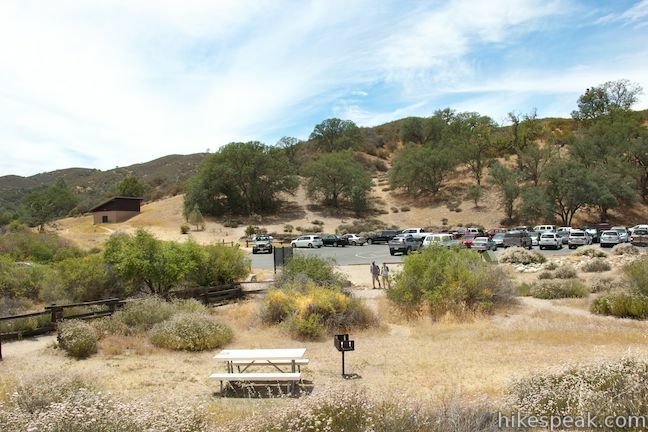 Pinnacles National Park has one campground with tent, RV, and group sites in an oak woodland on the east side of the park. How much for a day pass at the Pinnacles? There is an entrance fee of $20/vehicle. If you have an annual pass, you don’t have to pay. If you enter when there’s nobody to take your money, you’ll pay when you leave, unless there’s nobody to take your money. There are two park entrances, and there are no connecting roads between the entrances. Take that into consideration when planning. Also, the west entrance is closed after 8PM, but you can still get out if you’re inside. There’s no overnight parking permitted in the visitor lots. The east entrance is open 24 hours, and there are campgrounds operated by a concessionaire. What days are the caves completely OPEN? I know the caves are closed due to the bats but not sure when? The Balconies Caves are usually open year round. They only close when high water, etc. pose a danger to hikers. The other caves, Bear Gulch Caves, are closed from mid May through mid July to permit bats to raise their pups. 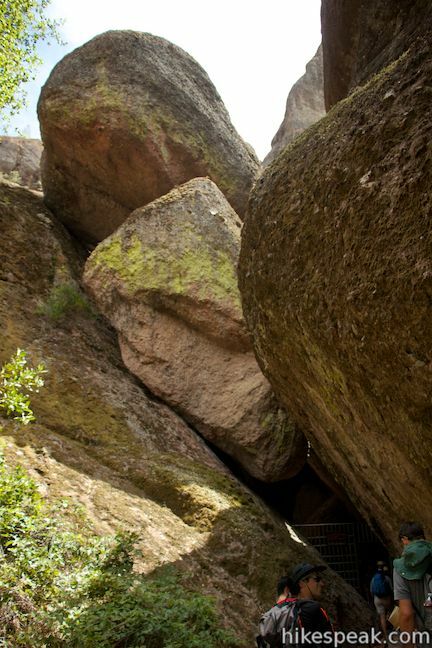 The lower half of Bear Gulch Caves are usually open the remainder of the year. 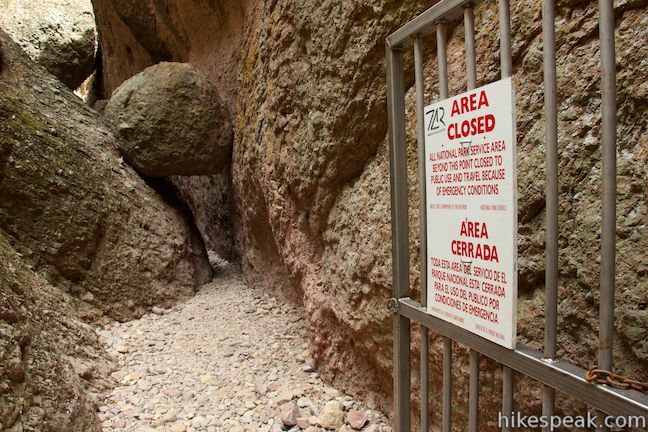 The entire Bear Gulch Caves may be open the last week of Mar & Oct or longer, bat permitting. Check for closures before you go. I have a small registered service animal. Would he be allowed on trails and in caves? According to the National Park Service website: “Pets are prohibited on all park trails ”. They do not mention any distinction for service animals.